For us, one of the highlights of the Alhambra and Generalife, the crowning glories of Granada, has to be the Open Air Theatre. Anyone who knows us will also know that we both love the theatre, and I was rarely more happy than when I was rehearsing and performing in the gorgeous gardens of the National Trust’s Smallhythe Place over the summer period. Some months ago, when friends Sam and Daisy were here, Andrew and I took a long-overdue wander through the Generalife Gardens and discovered this amazing outdoor auditorium, and we decided that we would have to book tickets to see something here at the earliest opportunity. Towards the end of June and into July every year, Granada hosts the Festival Internacional de Música y Danza and across the city there are performances ranging from solo artists, flamenco dance and song and full orchestras. This year saw the London Symphony Orchestra perform, so this is a full-scale arts festival, and very excited we were. The LSO dates sold out very quickly, but there was one performer we did want to see - Maria Pagés, a hugely famous flamenco dancer who appeared in the very first Riverdance stage production. We booked tickets, and then the children booked to come and stay, so we managed to book additional tickets for a night out together. One of the advantages of living in Spain is that outdoor events rarely get cancelled due to inclement weather. The night of the Maria Pagés performance came, and the sky seemed to be slightly unfriendly. After drinks and tapas in town, we trooped up to the Outdoor Theatre ready for our treat, and it started to rain. It should be added that theatre events in Spain, during the summer, do not start until 10 or 10:30 pm; none of this ‘curtain up at 7.30’ lark. As we entered the auditorium to take our seats, the thunder and lightning started, and half of the gathering audience screamed and ducked under umbrellas. The performance was duly cancelled! How?? We are in Spain! After that disappointment, and with the refunds from the cancelled show, we looked for the next big event. Again, every year, the Teatro del Generalife has a Lorca Festival. Federico Garcia Lorca is huge in Granada, and is deeply revered for his talent as a poet and playwright, immortalised due to the brutal way that this talent was snuffed out through his murder at the hands of anti-Republican rebels in 1936, and remembered as an antithesis of the horrors of the Spanish Civil War and the Franco years that followed. Every year, there is a production of dance, music and poetry that depicts a period of Lorca’s life, and this year the production examined the 3 months (March 7 to June 12, 1930) during which Lorca stayed in Cuba. Fortunately, the weather was perfect and the Teatro del Generalife is amongst the most beautifully set performance spaces we have seen. Walking up the hill above the Alhambra, the lit pathway leads through cypress trees to the auditorium, and Granada is silhouetted below against a backdrop of the last glows of the setting sun. 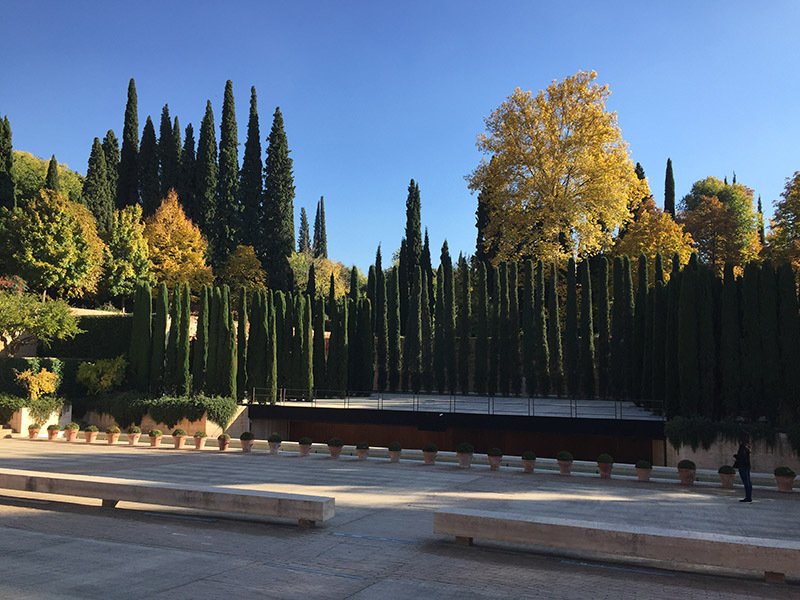 The lines of seats step up the raked auditorium, and the wide stage has rows of cypress trees acting as wings, and around the whole area there are the shapes and shadows as a constant reminder that we are in a glorious garden. The evening was warm and clear, and the atmosphere was very special. At times, through the performance, I had to look up at the sky to see the stars just to remind myself that we were sitting outside. The show, ¡Oh Cuba!, is described as “a work that combines poetry, dance and music…based on texts by Federico Garcia Lorca [and others]. The words of the Andalusian poet, whether published, handwritten, uttered or sung during his time on the island are the basis of this vibrant stage production featuring flamenco, Cuban son music and Spanish classical dance. As an ensemble piece, the intention behind the production was very well executed. The band, lined up at the back of the stage, were fantastic and the dancing throughout was vibrant and expressive. Even without knowing what went on in Lorca’s life, the narrator and the dance sequences did tell the story of a writer at the height of his creativity but still struggling with his sexual orientation, and Cuba opened up a new, thrilling set of experiences that Lorca found intoxicating. Lorca’s reputation preceded him, due to the success of his collection of Gypsy Ballads, and he was welcomed with some fanfare by the Hispano-Cuban Institution, the body that had invited the poet to the island. Both Andrew and I have been fascinated by Lorca since we arrived here, and have been to see the area surrounding the place where he was executed, and where his remains still lie, having never been found. We have seen his family’s country home on the edge of Granada, now in a park that was once open countryside. I am reading Ian Gibson’s authoritative biography of Lorca, and the personal nature of his story, the intimate details of a creative life that was so brutally ended echoes the lives of so many other individual innocent men and women who have been killed by war, murdered for their beliefs or their private lives, or persecuted for simply being who they are. Stories such as Lorca’s are brought into harsh focus even now, when you remember that this is not ancient history, and there are too many similar atrocities being perpetrated around the world today. If you come to Andalucia, visit Granada. Don't simply organise a trip to the Alhambra, as this city has a special magic. Take time to soak up the atmosphere at one of the many fiestas and festivals, where music and dance plays such an integral part. History is never forgotten here, even the tragic and bloody episodes, and goes back many centuries; this rich multi-cultural tapestry is celebrated and revered in a unique way. Immersing yourself in this way of life, even for a few days, changes and enriches your perspective. "I have spent the best days of my life here. The island is paradise. Cuba. If I ever go missing, they should search for me in Andalucia or Cuba."